the whole Bonjour Petit selection! In France, Moulin Roty definitely belongs to the childhood world. It is like an evidence. Actually, most of us (as French ones) have an experience with Moulin Roty, as a child, as a parent... or both! Moulin Roty embodies the very French ''doudou'' concept. The doudou is your kid's favorite's cuddly toy. The one that comforts him/her, that helps to calm down, that accompanies him/her in his/her dreams. It is like the perfect BFF. Too long to explain? Actually, pick one in the great Moulin Roty family and you will get right away what it does genuinely mean: softness, gentleness, tenderness. They are called loveys on Bonjour Petit... and we think that is a quite perfect match for doudou. The whole array of products by Moulin Roty is now available in San Francisco and in the United States thanks to the online boutique Bonjour Petit. Bonjour Petit, that recently celebrated its first anniversary, offers through its nice online boutique a unique selection of toys and gifts by highly qualitative and attractive European brands, and especially the French one, Moulin Roty, which is a landmark in childcare articles and baby gear. Behind the concept, you will find a French/American team with Robert, the expert, hailing from New Hampshire, while Guillaume and Clementine - the French touch - live in San Francisco. Guillaume is a French entrepreneur, who settled down in San Francisco with his family. Once he went back to France with her young daughter, he fell in love with the whole friendly Moulin Roty universe. The idea to bring the brand to the US and share it there was born. Since then, he is the one working hard to ensure that BonjourPetit.com offers a unique and user-friendly shopping experience. For Clementine, it is almost a family story, especially considering the charming toy store owned by her mom in France, where she learned a lot. Clementine is like the pen and pencil (but also laptop and Iphone:-)) behind Bonjour Petit. She has developed the brand image and communicated the story and beauty of Bonjour Petit’s toys with the world. Bonjour Petit will definitely make your life easier to find these treasures. The best thing is to check by yourself. 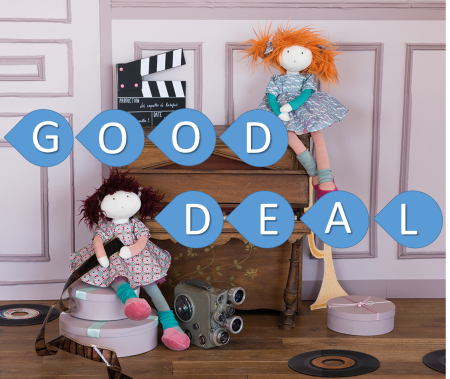 We will let you wander throughout the online store taking a look at doudous, sweet chatacters, bath, deco accessories, toys, music boxes, tiny clothes... A whole realm that makes life sweeter and prettier. 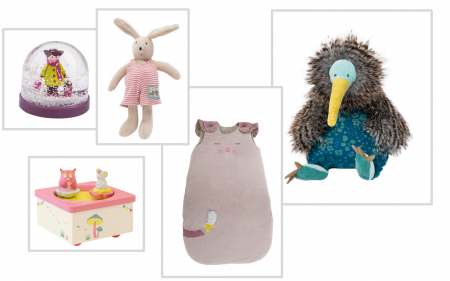 In our favorites... you will find the music boxes, the ''snow globe'', the sweet Kiwi, and the cute and comfortable sleeping bag. And we are very loyal to Amédée the duck, Jeanne the Goose and Sylvain the Rabbit, who accompanied so many French babies and toddlers in their dreams. 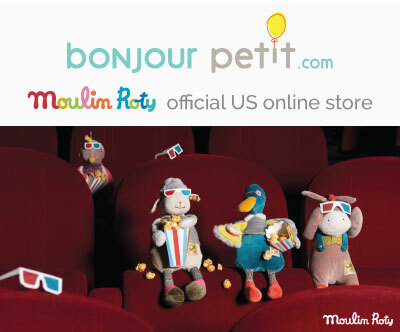 The Moulin Roty Official US Online Store. * The special offer with 10% off your purchase with the promocode LOSTINSF on Bonjour Petit will last until December 31, 2016.